Thousands get ready for Buffalo Big Board Surfing Classic in Good sized Makaha! This weekend there’s no doubt: Buffalo Would Go. And The Buffalo Big Board Surfing Classic Will Go Off in 5-8′ classic Makaha surf! Sunday see’s a new 10′ NW to grace the good will community event. 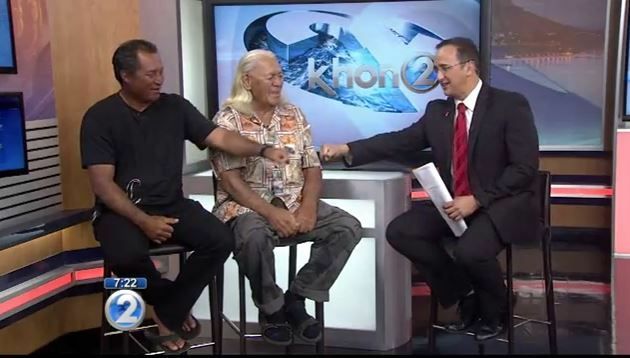 Watch KHON’s Ron Mizutani as he gives a great interview with one of Hawaii’s greatest Watermen, Buffalo and Brian Keaulana. SNN. The annual Buffalo Big Board Surfing Classic will celebrate its 40th anniversary at Makaha Beach with five days of surfing events held over the course of two weekends- Feb. 13, 14, 15, 20 & 21. As a grass-roots effort that began in 1977, founder Richard “Buffalo” Keaulana and wife, Momi, still play an active role in maintaining the cultural and family aspect of this cherished community event. More than 3,000 participants and spectators attend this event each year. Today’s events have grown to include nine disciplines of surfing, spread over 14 divisions. One of its divisions if for people 250-pounds-and-over; another showcases an old style of surfing using boards measuring over ten feet long. “In respect for our cultural heritage, we instituted a gratis system for contestants who wear the ancient Hawaiian malo while surfing in an event,” says Buffalo. “This event gives the Leeward community an opportunity to showcase our beautiful Makaha beach. It brings together the community: Not just the Leeward side, but the entire island and international visitors. Culturally, it teaches the people to respect and malama (care for) the ocean the Hawaiian way,” says Brian. Keaulana Sr., known as one of the founding fathers of surfing, spent 34 years as a lifeguard at Makaha Beach. An avid surfer and bodysurfer, he earned many titles in the 1950s and 1960s at the Makaha International Surfing Championship, which was known at the time as the most prestigious surfing contest in the world. In 1976, Keaulana was chosen to sail on Hokulea’s maiden voyage of cultural rediscovery to Tahiti as the steersman. Buffalo was inducted into the Hawaii Sports Hall of Fame for his dedication in perpetuating Hawai’i as the birthplace of surfing. He won the 1960 Makaha International Surfing Championship and in 1977, held the very first Buffalo’s Big Board Surf Classic. For more information on the competition, contact Bunky Bakutis at (808) 479-5925 or bakutisb@gmail.com. Entry forms and a list of surfing maneuvers can be downloaded at buffalosurfingclassic.com.